Nelson Slade Bond was born November 23, 1908, in Scranton PA, and grew up in Philadelphia. He attended Marshall University, Huntington WV, from 1932 to 1934, and that was also where he met his wife, Betty Gough Folsom; they married in 1934, and had two sons. He worked as a public relations field director for the Province of Nova Scotia in 1934-'35, then began freelance writing, at first with non-fiction pieces. The first of his many story sales came in 1935, but he came to science fiction and fantasy in 1937 with SF ''Down the Dimensions'' (Amazing) and the memorable humorous fantasy ''Mr. Mergenthwirker's Lobblies'' (Scribner's). The latter, which spawned several related stories, was turned into a radio series, and eventually a TV play. 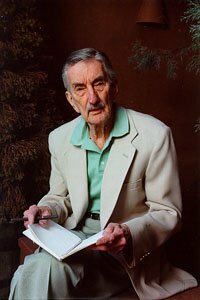 He wrote extensively for Amazing Stories, Fantastic Adventures, Weird Tales, and non-genre magazines Scribner's and Blue Book. His ''Magic City'' in Astounding (1941), part of the ''Meg the Priestess'' series, was very popular. His works were collected in Mr. Mergenthwirker's Lobblies and Other Fantastic Tales (1946), The Thirty-first of February (1949), The Remarkable Exploits of Lancelot Biggs, Spaceman (1950), No Time Like the Future (1954), and Nightmares and Daydreams (1968). His one published novel, Exiles of Time (1949), belongs to a tetralogy of short novels, ''Sons of the Deluge'', ''Gods of the Jungle'', and ''That Worlds May Live'', all originally published in Amazing in the '40s. A few of his plays have been published, including his TV adaptation of ''Mr. Mergenthwirker's Lobblies'' (1957), the comedy State of Mind (1958), and his two-act adaptation of George Orwell's Animal Farm (1964). He has been a well-known dealer in rare books for several decades, and was a very popular Writer Emeritus at the Nebula Banquet this past April. ''I wrote as many, or more, sports and detective stories as I did fantasy and science fiction. I never thought of myself as a science fiction writer; I thought of myself as a fantasy writer. But occasionally the fantasy would include hardware. That was particularly true in the 'Lancelot Biggs' stories, which were humorous space stories. The first one appeared in Amazing Stories, and then it shifted over to Fantastic Adventures, then to Weird Tales. When I started writing various kinds of stories for Blue Book, I worked up to $500 per story, whatever the length. ''I began writing for radio after they started adapting some of my stories. I thought, 'Well hell, I can do better than that,' and I started adapting them myself. After a while, a couple of series opened up, and they asked me to become the writer. I wrote 52 weeks of 'Hot Coffee' and about 26 weeks of 'The Sheriff Show', a comedy western. Then television came along. I had just written 'Mr. Mergenthwirker's Lobblies' as a radio series, and I adapted it for television. It became the first television play ever aired on a network. The network, however, consisted of Boston, New York, and Washington. (This was 1946.) The presentation was so elaborate, there was a studio audience, and they printed a program for it. Unfortunately, no copy of the show exists, because they didn't have tape in those days. All they had was kinescope, flickering black & white movie stuff. ''That was probably the golden opportunity of my life that I threw out the window. After the play was done, the director said, 'This is a brand-new medium. Why don't you come up here and get into it with us?' They couldn't pay me very much, and I said, 'I'm making more than that in radio right now,' so I turned it down. The director's assistant, Fred Cohen, went on to become president of NBC. ''But I wrote about 15 or 20 television plays, some of them adaptations of my own things, others original. 'State of Mind' was a fantasy about a man who got pissed off at modern civilization. He said, 'I'm gonna secede from the Union.' So he did. I thought it was a helluva good idea! (Still a cute play, but it's not produced anymore.) I adapted my second Mergenthwirker/Lobblies story as a television play, and then there was a third one. ''Then came Exiles in Time (1949), my one novel. It was the Ragnarok story, when the Lemurian civilization was knocked off by a comet striking the earth. (Now they're worrying about that again.) The project was to have been a series of four books published independently and ending with that one, set in the future, but then the publisher, Jim Williams of Prime Press, died, and the project died with him. ''August Derleth, who I had known and corresponded with for years, asked me for a collection of newer stories for Arkham House, and when I put together Nightmares and Daydreams, to fill it out I wrote the original poem 'I'll Report', which was the only one of my verses that ever appeared in book form. But I always had a desire to write poetry, good or bad or indifferent. For the pulps, I wrote narrative-length poems 'The Ballad of Blaster Bill', 'The Ballad of Venus Nell', and a few others. I submitted a long poem entirely written in iambic pentameter to Blue Book, and the editor said, 'Nelson, you know Blue Book doesn't print poetry.' I rewrote it in paragraph form and resubmitted it, and he bought it. So 'Life Goes On' is a poem which actually scans, if you read it that way! ''I wrote six to eight 50,000-60,000-word novels, but I never wrote one of those monstrous 300,000-word things you read nowadays, and I don't think I would have been able to, because one of my axioms of writing has always been that good stories are not written - they're rewritten. I would talk a story into the dictaphone, Betty would type it, then I would revise it, and it was always shorter, because I cut it down, trimmed. The story had to be packed tight together. So I was fair at 10,000 words, good at 5,000 words, and excellent sometimes at 2,500. The shorter the Bond, the better the story, as proven by 'Vital Factor' and a few stories like that. © 1998 by Locus Publications. All rights reserved.